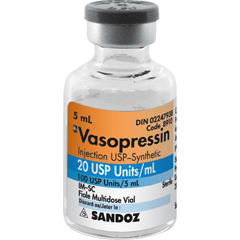 Vasopressin is useful as a treatment of certain conditions such as diverticular disease, bleeding esophageal varices, central diabetes insipidus and pre operative patient with von Willebrand’s disease or hemophilia A to reduce the chances of uncontrollable bleeding. Vasopressin is a hormone which is naturally produced and released by the posterior pituitary gland. Vasopressin may interact with few forms of receptors. These include V1 receptor, V2 receptor and V2 like receptor. V1 receptors are present on the smooth muscle. Stimulation of V1 receptor may lead to vasoconstriction. V2 receptors are present on the renal tubular cells in collecting ducts of the kidney. Vasopressin may bind to the V2 receptors and may increase the water reabsorption and permeability of the collecting duct. This will lead to an increase in the retention of the water. V2 -like receptors may lead to an increase in the factor VIII activity when stimulated by vasopressin. The common side effects of vasopressin may include hypersensitivity reaction, headache, hyponatremia and vasoconstriction.